Do you chew, chew gulp? Or do you chew, chew, chew then lots more chewing and gulp? How many times should we chew our food? The general advice is that we chew soft food up to 10 chews per mouthful, and for more fibrous food, like meat or vegetables, up to 30 times. Would you do this? Who takes the time to properly chew their food these days? Well, one study revealed that volunteers who chewed each mouthful 40 times ate 12 per cent less food than those who chewed just 15 times. When food TASTES really delicious, and with every mouthful your brain says, “mmmmmmm,” “MMMMMMMM,” and “MORE” with delight, you want to make every mouthful last as long as possible for all the pleasure it delivers. Did you know that eating raw food awakens your tastebuds and raw food recipes are absolutely PACKED with flavour, resulting in sheer PLEASURE! Who knew eating healthily could taste so good? 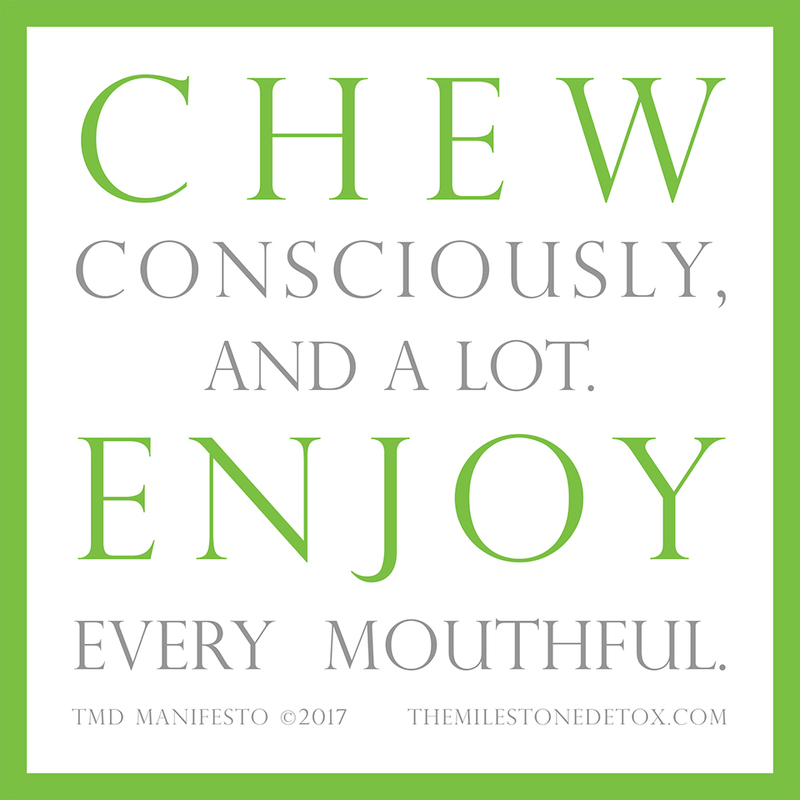 When you take the time to consciously chew your food, the quantity of benefits are many, so the real question is, why wouldn’t you chew more?! Chewing your food slowly, consciously and a lot results in: better digestion from the increase of digestive enzymes; eating smaller portions and feeling fuller quicker, so decreasing calorie consumption (leading to weight loss); increased absorption of nutrients and energy from the food; longevity; more saliva for easier food transit to the stomach; partially liquified and smaller particles of food which are easier for the body to break down into the molecules it absorbs; potentially avoiding gas and bloating, diarrhoea, constipation, abdominal pain, cramping and other digestive problems linked to undigested food particles entering the intestines; TASTE ENJOYMENT. During a juice detox, you wake up your taste buds so that afterwards, your food just tastes BETTER. During a raw food detox, you are introduced to flavours and methods of treating plant-based foods which result in many happy mouthfuls and full tummies! Come and join us for some delicious chewing adventures on a Raw food Weekend or our special Raw Food Dinner Evenings or let our Juicer do the chewing and come on a Juice Detox we’d love to see you book your detox today!